I am BEYOND honored to have made Top Online Engineering Degree's Ultimate DIY Library: 100 Blogs to Help You Build or Make Anything. 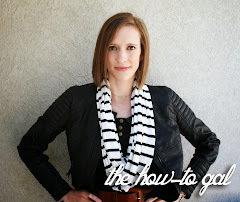 The How-To Gal is ranked number 9 in the "General Resources" category. Some of my other bloggy friends like the DIY Show-Off, One Pretty Thing, WhipUp, Craft Gossip and UCreate are listed as well! To find the other DIY blogs, visit the complete list here. WOW Anna Rose this is so great! How did you find out that you were on the list? Amazing! Enjoy reading and trying things you post! I love the way you made the headband flower! I've made my own so far but I love the felt idea! You are BEyond creative!!! !